The Town Scryer: Craps Again! The town of Webster, Texas found itself in the unusual position of having an exact tie in their runoff City Council election. The two candidates for the council seat, Diana Newland and Edward Lapeyre, each received 111 votes. The contest was decided by rolling dice, with Ms. Newland being the winner. I think they may be onto something here. 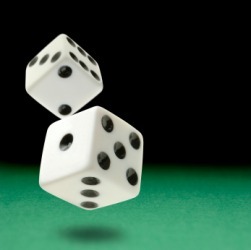 Considering the quality of leadership the voters of Texas have been giving us lately, why not just skip the election and go directly to the dice? It's not like they could do any worse. Besides, the high-rollers have been deciding our elections for years anyway.